The day the league changed forever. It's one of those "I remember exactly where I was" moments in life. The Indiana Pacers visited the Palace of Auburn Hills to take on the Detroit Pistons in a matchup of Eastern Conference powerhouses on Nov. 19, 2004. 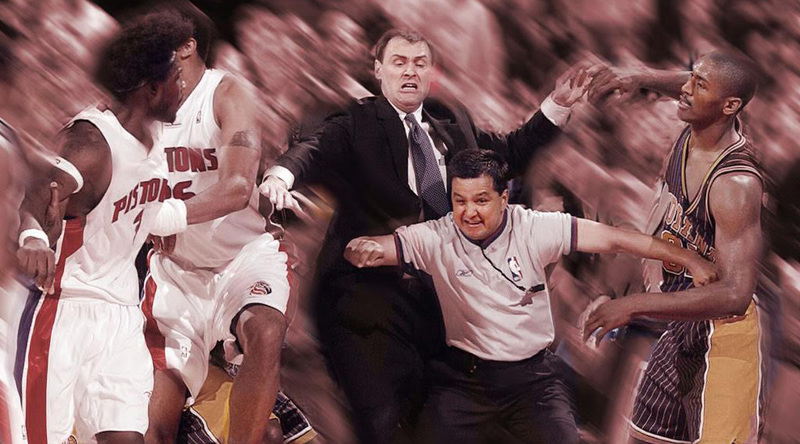 What ended up being a lopsided affair between rivals got out of hand when Ron Artest delivered a stiff foul to Ben Wallace in the closing minutes. As players from both teams took part in a heated confrontation, what happened next would forever change the landscape of the NBA. Sprawled out on the scorer's table as officials attempted to regain control of the situation, Artest was hit with a cup of beer thrown by a Pistons fan. Already enraged from the dispute with Wallace, he ran into the stands and attacked who he believed to be the assailant—the first exchange in what would become known as the "Malice at the Palace." Pistons fans continued to attack Pacers players, while Stephen Jackson and Jermaine O'Neal joined the melee with punches of their own. More cups of beer were poured on Pacers players as they exited toward the locker room. In the aftermath, 10 players from both teams were suspended, five of which were also charged with misdemeanor assault and battery. The NBA also imposed new security guidelines and alcohol sales rules for every arena. Furthermore, each team was ordered to put at least three security guards between players and fans. For better or worse, the brawl was a pivotal moment in NBA history. This weekend marks the 13th anniversary of the game, and we're taking a look back at the key participants in the Malice at the Palace and the sneakers they wore. Role in the Brawl: Artest will forever be remembered as the face of the Malice at the Palace and the man who redefined the way NBA handles player conduct. Initially, he was just the agitator who got Ben Wallace to lose his cool with a hard foul. But while laid out on the scorer's table to emphasize his lack of involvement in the scuffle, he was pelted with a beer thrown by a fan, and all hell broke loose. Unfortunately, the famous fan with the terrified look wasn't even the guy who launched the beer—the culprit, John Green, can be seen grabbing Artest from behind and attempting to put him in some sort of headlock. Artest later threw a punch at a Pistons fan who walked on the court and confronted him, before being restrained by team officials and taken to the locker room. Fallout: Suspended 73 regular-season games, 13 postseason games and charged with misdemeanor assault and battery. Role in the Brawl: Wallace's on-court integrity can never be questioned, but his actions on that day pretty much triggered the brawl. After receiving a hard foul from Artest near the end of the game, Wallace aggressively shoved him in retaliation. Unable to be calmed, he also threw an armband at Artest while he was laid out on the scorer's table. Ironically, Wallace's brother David was in the crowd taking swings at Pacers players. Role in the Brawl: With the game well in hand, O'Neal started the sequence as a spectator from the bench. He wasn't even really involved in the player dispute, but famously delivered a sliding Super Saiyan punch to a Pistons fan who ran on the court. Fallout: Suspended 25 games (reduced to 15 on appeal) and charged with two counts of misdemeanor assault and battery. Role in the Brawl: You weren't supposed to say it at the time, but Jackson was who you were probably rooting for during the brawl. He's the kind of guy you want to go to war with. He went at Ben Wallace because Wallace went after his teammate. He jumped in the stands and punched a bunch of fans because they were doing the same to his teammate. While his actions were inexcusable, he had his teammate's back—and paid a hefty price for it. Fallout: Suspended 30 games and charged with misdemeanor assault and battery. Role in the Brawl: In perhaps the most underrated moment of the brawl, Tinsley used a long-handle dust pan as a weapon to threaten Pistons fans while his teammates were being escorted back to the locker room. Fallout: No suspension or fine. Shoe: Air Jordan 13 Retro "Wheat"
Role in the Brawl: Jones was an innocent bystander, but somehow managed to catch a shove from Rasheed Wallace. The former Terror Squad member was also forced to lean back after taking a sucker punch from a fan who ended up being Ben Wallace's brother. Role in the Brawl: Considering Sheed's reputation, he was a surprising peacemaker during the initial player skirmish, pushing players away to keep them separated. Of course, he ended up exchanging a few words with Jamaal Tinsley, but it didn't escalate beyond that. Role in the Brawl: Hunter took charge of helping Ben Wallace calm down. Shoe: Air Jordan XIX SE "East"
Role in the Brawl: As expected, Hamilton mostly played peacemaker, but did have some words with Pacers players.